If time is short and you want to discover the magical Isle of Skye then this tour is just for you. Explore mysterious Loch Ness; iconic Eilean Donan Castle and awesome Glen Coe too. It's amazing how much of Scotland we can show you in two fun-packed days! After a leisurely breakfast we board our coach for a day of discovery. From Inverness we retrace our journey along the banks of Loch Ness to visit the village of Invermoriston to see the charming ruined bridge designed by Thomas Telford, who constructed the Caledonian Canal. We continue through Glen Moriston and Glen Shiel, scene of the 1719 battle, where the dramatic range of mountains known as the ‘Five Sisters' dominate the landscape. One of the most iconic images of Scotland is Eilean Donan Castle *, on an island at the head of Loch Duich. We make a stop here so you can visit and enjoy the views from this most photographed of castles. We head ‘over the sea to Skye' by way of the road bridge, rather than the ‘bonnie boat' of the song, and make for the main town of Broadford, with a stop for lunch. After lunch, our route takes us along the beautiful coastline towards the moody peaks of the Cuillin mountains. Our main stop of the day will be in Portree, the largest town on the island. Take time to enjoy a stroll down to the picturesque natural harbour which is home to a fleet of fishing boats. As we cross back over the Skye Bridge to the mainland, look out for the little island of Eilean Ban. Gavin Maxwell, author of ‘Ring of Bright Water' about a family of otters, lived in the lighthouse keeper's cottage for a while. Our final stop of the day is the secluded village of Achnasheen, which we reach through picturesque Glen Carron. The concluding part of our tour takes us to Garve and through the Black Isle, with fabulous views over the Moray Firth to Inverness. After a short comfort stop in Inverness board the train for your scenic rail journey to either Edinburgh or Glasgow #. Please note that the train journey is unescorted and part of the journey may be in darkness. 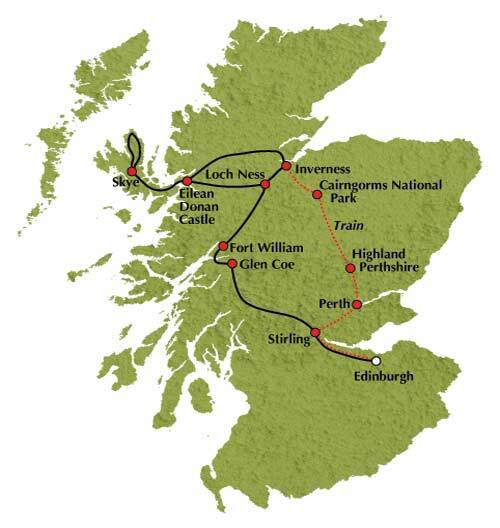 Tour Highlights: Bonnie Strathyre, Rannoch Moor, Glen Coe, Fort William, The Great Glen, Loch Ness, Urquhart Castle and Cruise (optional), Inverness, Invermoriston, Kintail, Eilean Donan Castle (optional), Isle of Skye, Loch Carron, Achnasheen, Black Isle and scenic rail journey.